Last night I had the extreme pleasure of begin able to attend the Miss Fulton County pageant, located at Gloversville Middle School. It is always beneficial to watch pageants, even if you are not competing Not only only do you see first hand what it is like to be in the audience’s position, but you are able to pick up tricks and tips from the other contestants, and see who wins and will potentially be your competitor if you also move on to compete at State. Plus, above all else, it is great to support your pageant sisters as they compete for the crown. You want people supporting you, so it is always nice to return the favor! I went with Lauren and my mom, and the Albany girls (Chelsea, Amanda, Adrienne and Anneliese) all drove out as well. We had bought tickets ahead of time, as sometimes they sell out, and were able to get a good place in line. We let the other girls cut in line with us, instead of going 5 miles out the door. Not only did one very beautiful and talented lady gain entry to the Miss New York pageant, but nearly $8,000 was awarded in scholarship money. I think that’s one of my favorite parts about competing in pageants. The prizes go directly to the secondary education of the winners and runner ups. 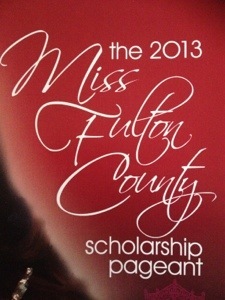 The contestants for the Miss Fulton County pageant must live within the 500 square mile boundary line of Fulton County. This makes the eligibility rather difficult, and only a few girls are able to compete. However, this does not make it an easy win for any of the girls. They have to work twice as hard to stand out, as the expectations are so high. Of the ten girls, 4 of them were previous title holders. Two of them had been Outstanding Teens. Two had placed, but not won before. And one was participating for the first time. All in all, with 10 girls, the group of ladies was very diverse. Opening number was very unique. Rather than play another generic song, the reigning Miss Fulton Country 2012, Coleen Gagne, performed Sparks Fly by Taylor Swift. As the contestants were joined by 8 dancers from the High Performance Dance Studio, Colleen sang and introduced each girl. Next came the Onstage Question category. It was a neat setup. Rather than each girl walking across the stage and standing next to the emcee, a tall table and two bar stools were brought to the stage. I have to admit, these questions were very difficult. A few were slightly simpler than others, but I think I would have had a hard time on them. Morgan: What can be done to address the state mandates in NY schools and the lack of funding? Katelynn: What do you think of the senates proposal that would streamline the citizenship for immigrants without documents? Danielle: What is your take on the legalization of euthanasia? Misty: If it was possibly for you to take one thing along with you after death, what would it be and why? Tristen: What do you think is the most important discovery the last century and why? Emily: Do you believe global warming exists, or do you believe with the critics who say it is a hoax, and why? Amanda: What do you want to gain from participating in pageants? Jessica: Do you support president Obama’s stance on gay marriage and why? Courtney: What bothers you most about what is happening in the world today, and why? Heather: What do you think about cosmetic surgery in pageantry. Does it give an unfair advantage or not? A few of the girls did stand out. I thought that Misty did a great job or turning the question around to reflect her platform. Emily did a fantastic job of answering the questions, but also explaining both sides of the argument before stating her own opinion. As an LGBT supporter, I was a huge fan of Jessica’s answer. She didn’t even hesitate as she said she supported marriage equality She didn’t try to tame down her answer for people who might oppose. She was strong in her answer. While the girls changed, the judges were announced. I always wish we could know who the judges were before interview. They can tell when you are making stuff up to impress them, but at the same time, it would be nice to be able to prioritize the things you say based on the careers and experiences of the judges. But I’m sure the directors don’t want contestants to know, for that reason. Shannon Oliver made her first official appearance as Miss New York 2012 at the pageant, and shared her personal story regarding how she reacted to Mallory winning Miss America and assuming the Miss New York crown. Then the new Miss Fulton County Outstanding Teen crowned as well. Shannon Ryan, Miss New York’s Outstanding Teen, was there to help. Yes, Miss New York and Miss New York’s Outstanding Teen are both named Shannon. It was very nice to have this integrated into the Miss pageant. Next up was the Lifestyle and Fitness category. I was very impressed with the confidence on the stage. Katelynn, Misty, Emily, and Courtney all really stood out to me. During Intermission, Lauren and my mom had to go to the bathroom. I decided to take pictures with Shannon Oliver instead, even though my bladder was quite full at that point. She is seriously one of the most grounded titleholders I have ever met. Plus, her platform is on diversity, which I support 100%. I won’t deny it feels kinda good to be taller than her, even if it is just a hair. Talent is always my favorite part of the pageant; possibly because it is worth the most, but also possibly because it really allows the girls to stand out and shine. Once again, there was a diversity among the girls. There were 2 vocal performances, 2 cloggers, two ballet dancers, two rhythmic gymnasts, a tumbler, and a pianist. I thought Katelynn and Jessica had the best performances, although Danielle was a very tight third. She sounded nervous, which never happens. Evening Wear looked like we were on the clouds. I think 3 of the contestants did not wear white. It was very hard for any of them to stand out, except for Amanda, who had full black and mesh, and Misty who had big blue butterflies on her train. Katelynn and Jessica had the best presentations, in my opinion. The ladies all came back out for crowning. Misty won the community service award and Miss Congeniality. It’s no surprise she won MC, as she is a complete sweetheart. Courtney won the interview award, and Katelynn won talent. 2nd Runner Up is Danielle, 1st Runner Up is Courtney and our new Miss Fulton County is… Katelynn!